...... to ensure that only applicable values are displayed as choices in the dropdown list. SharePoint Cascaded Lookup creates relationships between columns in the same list: you build a parent-child relationship between a set of columns so that the value you choose in the parent column determines the options presented in the child column. * The Source List, which is the list from which Cascaded Lookup will look up information. The Source list can be in any site. * The Source Column, located in the Source List, that contains all of the possible values for your drop-down menu. 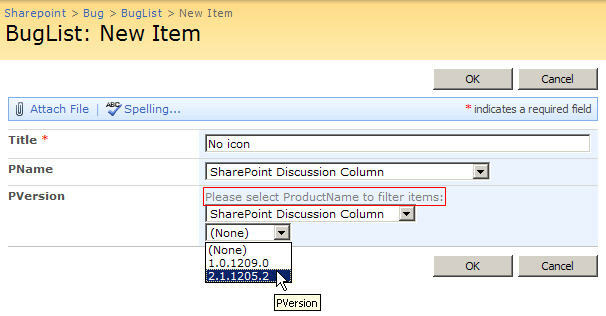 * The Filter Column, also located in the Source List, which is used to filter out irrelevant data from the Source Column so that only values that fit your filter criteria will be possible as choices. Qweas is providing links to SharePoint Cascaded Lookup 4.0.330 as a courtesy, and makes no representations regarding SharePoint Cascaded Lookup or any other applications or any information related thereto. Any questions, complaints or claims regarding this application SharePoint Cascaded Lookup 4.0.330 must be directed to the appropriate software vendor. You may click the publisher link of SharePoint Cascaded Lookup on the top of this page to get more details about the vendor.